The Hubei Shishou Milu National Nature Reserve is part of the “E-Xi Ecotourism Zone”, also known as “Western Hubei Culture and Ecotourism Circle” that was established in November 2008 in the west of Hubei Province. It is located on the banks of the Yangtze River. The site is a wetlands ecosystem and contains population of the Pere David deer. 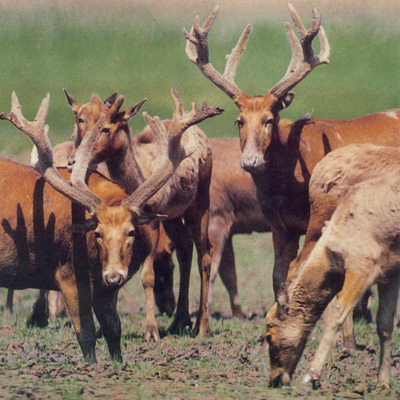 The Pere David’s deer, Elaphurus davidianus, also known in China as Milu. It is classified as a Grade 1 protected species in China as well as by International Union for Conservation of Nature as being EX – Extinct in the wild. Milu is a unique Chinese endemic species that became extinct in China in 19th century. It was reintroduced in 1985 by Maria Boyd. In 1992, a Milu reserve was established along the Yangtze River which later became a National Nature Reserve and was eventually placed under the direct responsibility of Hubei Province Environmental Protection Bureau since 2007. Administered by Bristrol Conservation & Science Foundation, the project is designed to improve the offer to tourists by providing greatly improved interpretation material including dual signage in Chinese and English, providing bilingual Reserve brochure and map for visitors as well as training local staff and provide equipment to help improving communication material.